The embodiment of the ancient philosophical dictum mens sana in corpore sano, a sound mind in a sound body, Robert T. Harrington takes his place as perhaps the most accomplished student-athlete in the long and storied history of Lowell High School. Bob served as a stalwart lineman for legendary Hall of Fame Coach Ray Riddick’s Football teams during the early 1960’s, manning the important left tackle position on Lowell High’s 1961 juggernaut which completed the regular season undefeated. Only a 6-6 tie with arch-rival Lawrence before over 18,000 fans at Cawley Stadium marred the Red and Gray’s perfect regular season. Lowell traveled to Jacksonville, Florida, for a post-season Gator Bowl contest against Sunshine State power Lee High School, a close contest resulting in a 14-0 defeat for the Raiders. Bob’s stellar play up front along with his teammates on the offensive line enabled Lowell’s backfield to enjoy a productive season, outscoring the opposition 188-40. During the winter season Bob turned his attention to Track, specifically the shot put, under the tutelege of Hall of Fame Coach George “Mike” Haggerty. Bob developed into only the 5th 50-foot shot putter in LHS history, regularly scoring key points for the Red and Gray. Bob continued his exploits in the shot put and added the discus to his repertoire as a member of Coach Haggerty’s Outdoor Track & Field squad. Incredibly, while a member of the Track team, Bob also found the time to be the number one player and Captain of an undefeated LHS Golf team during his senior year (1962). Bob concluded his Lowell High School athletic career with the rare distinction of earning four varsity letters during his senior year (1961-62). While undertaking this hectic athletic schedule, Bob managed to focus on other aspects of student life on Kirk Street. 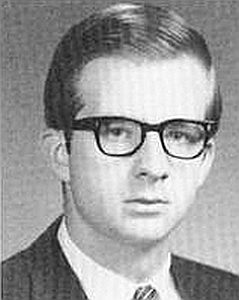 He served as President of both the Student Council and the National Honor Society; and in perhaps the most impressive of all his countless achievements at Lowell High School, Bob was named as Valedictorian of the Class of 1962, indicative of his rank of #1 out of 530 students academically in the Class of 1962. He also received a prestigious Carney Medal, representing his academic excellence. After graduation Bob attended Harvard University, where he continued to compete in the shot put on the Crimson Track & Field team. Bob graduated in 1966 and eventually enjoyed a career as one of Boston’s most respected attorneys. After his retirement Bob returned to Lowell High School as a volunteer coach in the throwing events. Under his expert direction, LHS throwers enjoyed unparalled success during his 10-year tenure. Of the fourteen 50-foot shot putters in LHS history Bob coached 6 of them. Several of his athletes set LHS and Merrimack Valley Conference records and won honors at the State and New England levels in both the shot put and the discus. In addition to Coaches Riddick and Haggerty, Bob joins several teammates in the Hall of Fame, including Walter Nelson and Tom Machado. Other: 4 varsity letters LHS Senior Year!